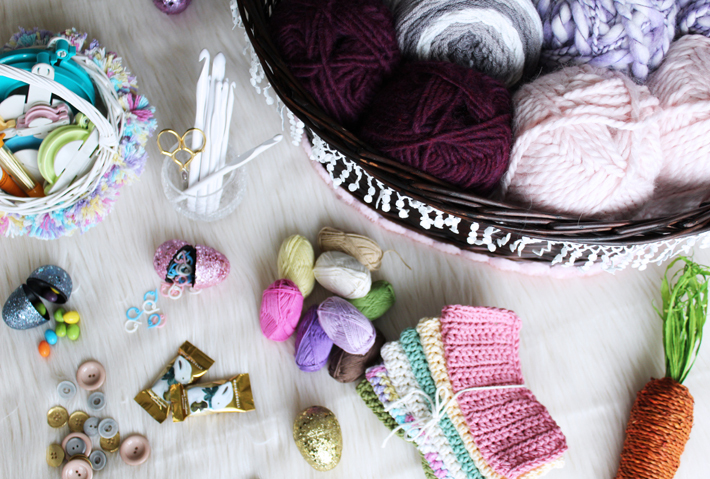 Easter can mean a lot of different things to a lot of different people, but today I thought it would be fun to put together what *I* think I would want in my Dream Crocheter’s Easter Gift Basket. Yeah, that’s right. Dream. Crocheter’s. Easter. Gift. Basket. Pick up your jaw, wipe your drool and let me show you what the Easter bunny wants to bring you this year. Maybe you can replicate to gift to YOUR favorite crochet/fiber friend! So, I wanted to make sure this DREAM basket was just that, dreamy. I found this super cute basket at my local Jo-Ann Fabric and Craft Store. Even though it was cute already, I may have just really wanted another excuse to use my hot glue gun again.. Haha! So, off went the linen insert and on went some super cute details. 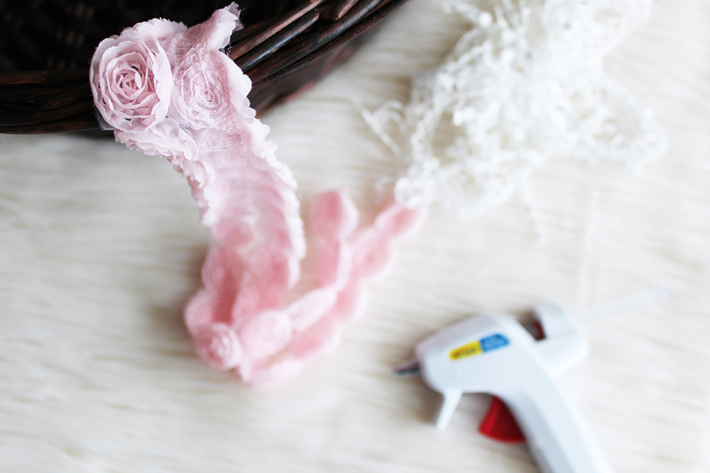 Using my glue gun, I carefully glued on this white fringe trim I had found as well as the pink rose trim I found in the same section. 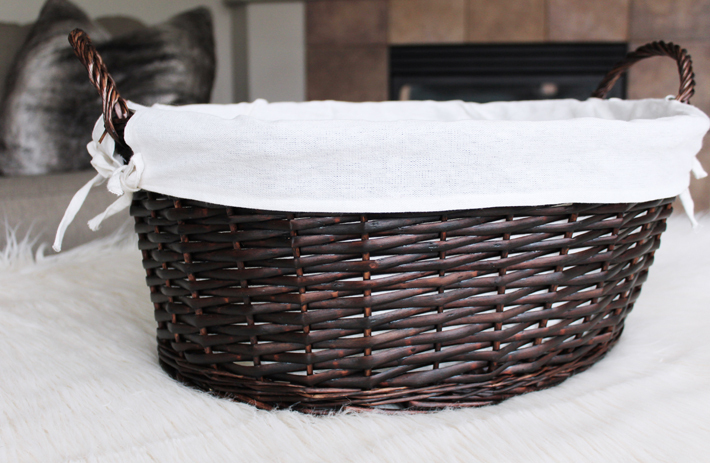 I’m SO happy with how the end result of this basket turned out! So spring-like and pretty!! Now that this basket was done (just wait until you see what I plan to use it for! ), I knew I needed a smaller one as well. 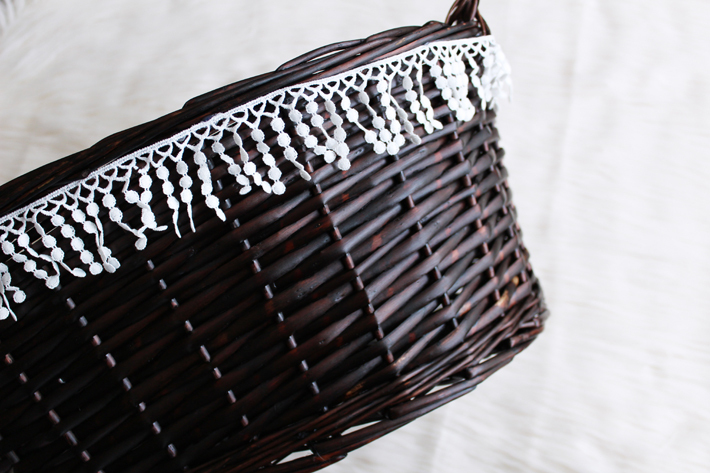 I found a darling little white classic-styled Easter basket and knew it was perfect. Using some cotton yarn, I made some pom poms to hot glue around the outside. Those Clover Pom-Pom makers are seriously awesome! 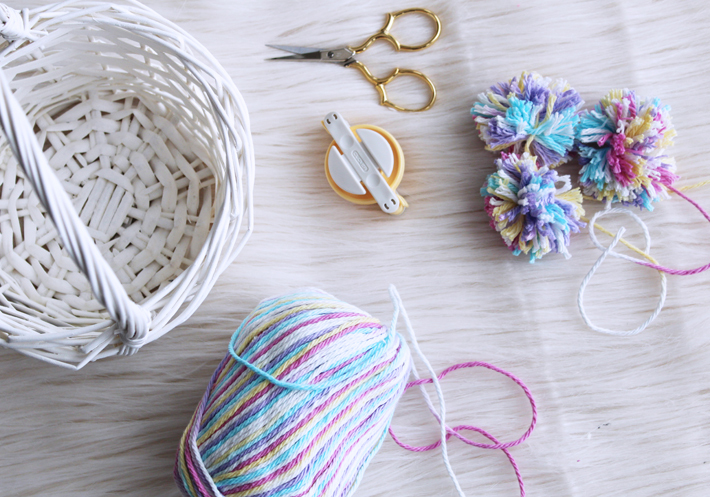 Using the pom pom makers (see a great tutorial on how to use these gadgets here), I handmade twelve different poms. I did do some trial and error at first to decide how much yarn I wanted to use per pom pom as well as which size I wanted to use on the basket. Don’t worry about taking those extra steps to really make a project you’re proud of! See those scissors? 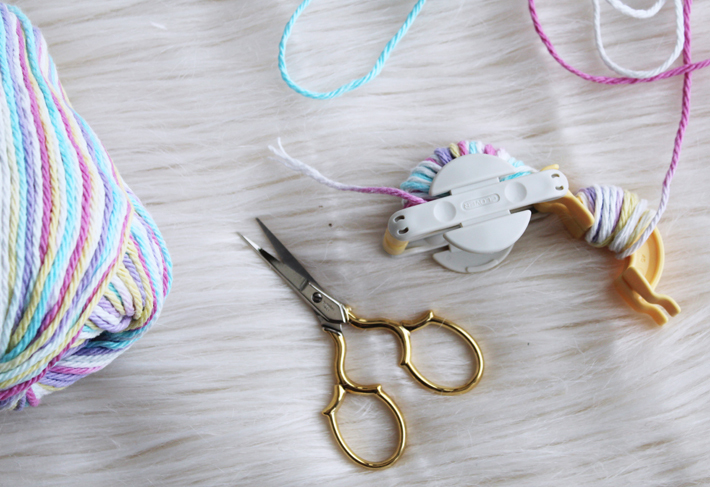 Every crocheter wants a pair of fancy, photogenic scissors so I definitely didn’t forget those. These Gingher brand scissors are so beautiful and really makes crafting feel classy and indulging! A definite must-have. After completing all twelve cotton pom poms, I trimmed them and cut the ends short as well. 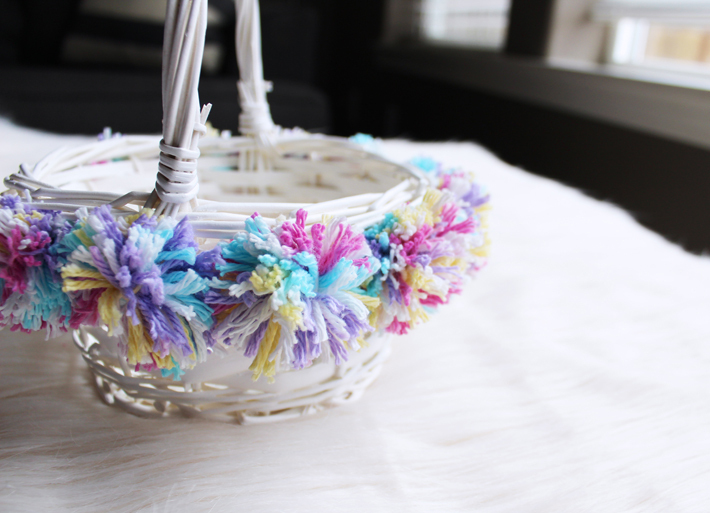 I squeezed a dime-sized amount of hot glue into the middle of each pom pom and held them to the basket until they set. The finished piece is just so darn precious! My daughter has officially claimed it for her bedroom once Easter has passed. I’m not sure about you, but even though I know how to crochet, it’s not often I actually KEEP anything I make. Can you relate? Ha! So, to remedy this, I decided that in this dream basket, we would definitely need some handmade goodies. 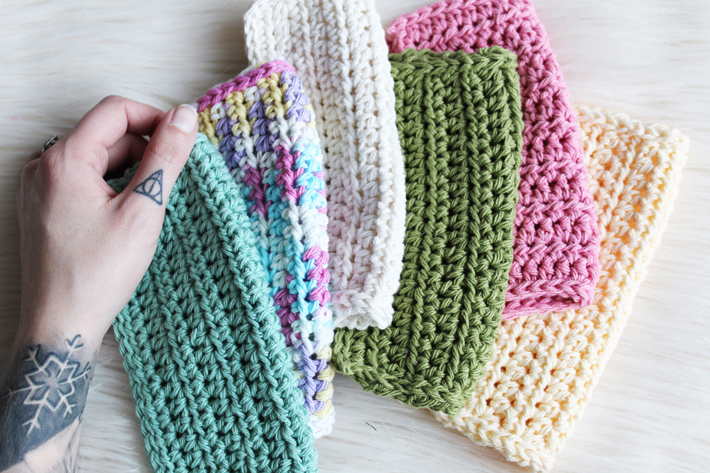 What is better than a set of handmade cotton wash rags?! Seriously so thoughtful and a touching gift that the recipient can keep for many years to come. I even included a beginner-friendly crochet pattern here for the ones I used in this project so you can make some of your own to gift out as well! Alright, now we get to the FUN parts: putting the baskets together. Now, remember, we are putting together DREAM gift baskets, right? 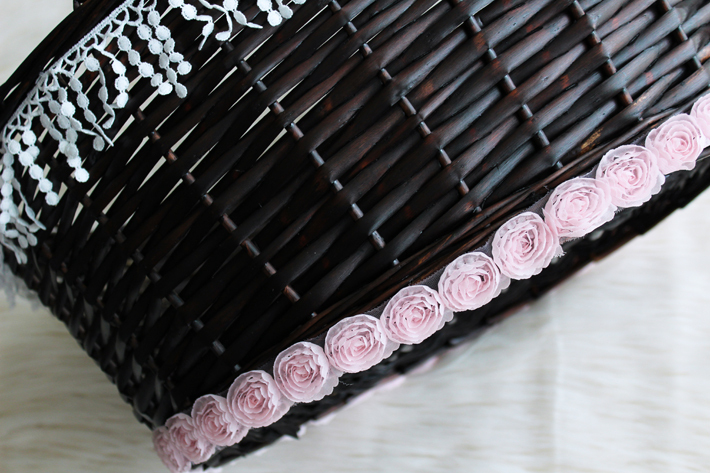 And remember that dreamy basket we made earlier? She’s back. 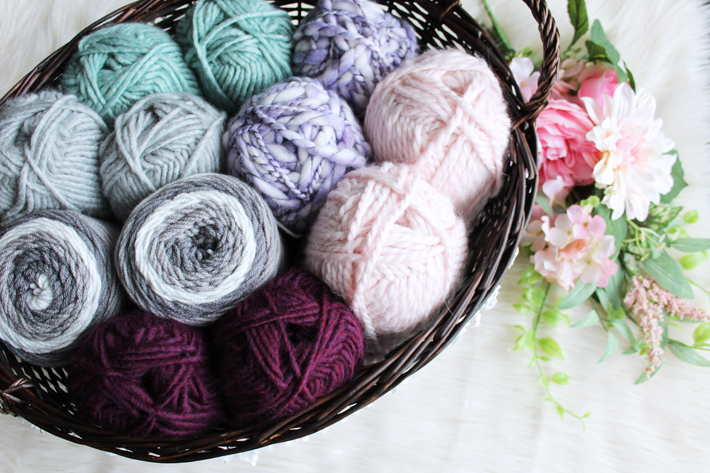 When I was planning this project, I asked myself what I’d want in my dream gift basket and said, “Well, honestly, I’d just want a big basket of yarn..” So that’s exactly what I did. Deliberately choosing colors and textures that summed up spring vibes for me, I put together my swoon-worthy basket of goodies. Including Buttercream yarns (some of my FAVORITE yarns to play with), a couple Sweet Rolls (if you aren’t familiar with these, they’re sort of a big deal right now) and, of course, some bulky roving in seriously scrumptious colors. 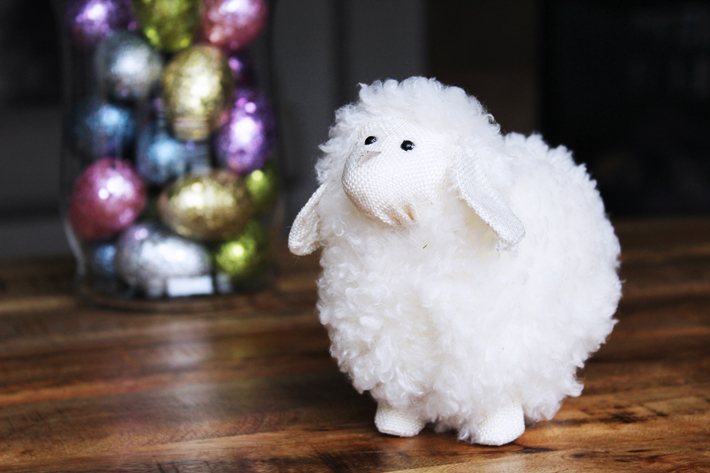 I know we used the pom pom makers earlier, but only because I couldn’t resist! 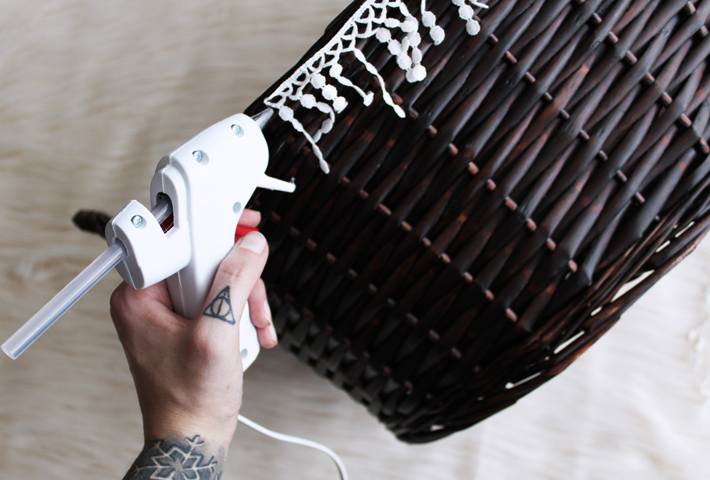 But these handy gadgets were definitely one of the first items I knew I needed to include in this basket. 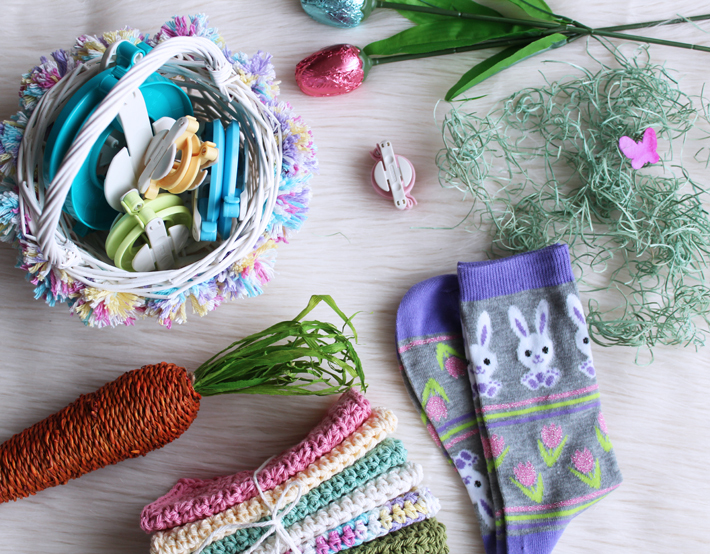 Throw in some cozy, sweet Easter socks to really nail it! And GUYS! I even found Easter grass that included a pink butterfly in each package. Details, guys. What’s an Easter basket without Easter eggs? 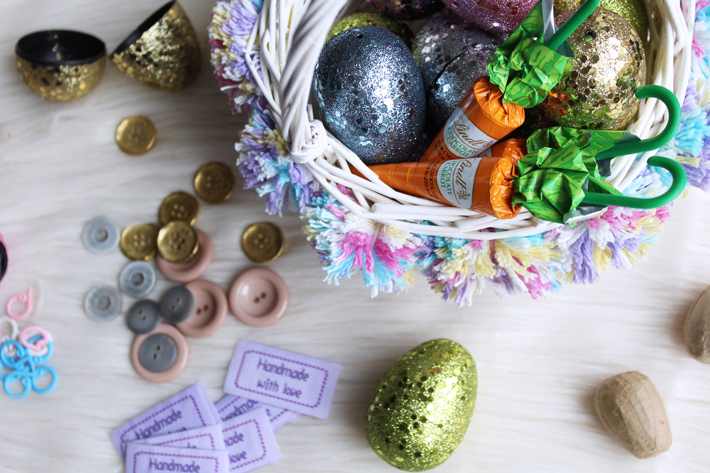 How amazing would it be to open it up and find the cutest buttons, handmade label tags and stitch markers?! Again, guys. Details. Let’s not forget the mini skeins of yarn.. These are just too cute! 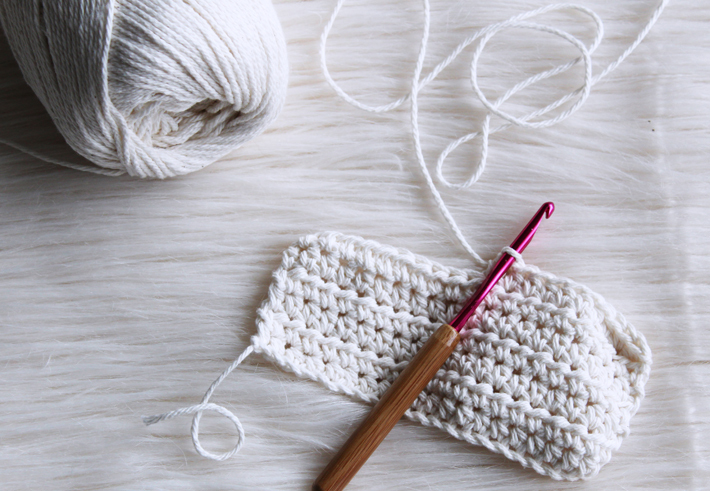 Crocheters really have two things on their mind when it comes to their craft: yarn and hooks. 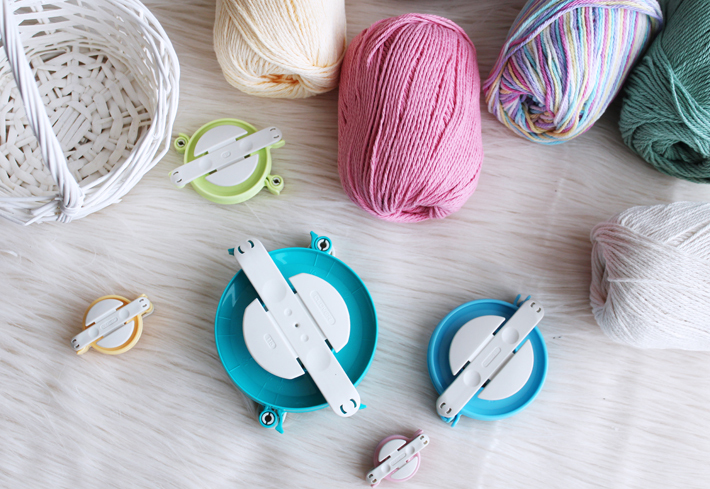 Now that yarn has officially been covered, but what about hooks? I found these super great and lightweight WHITE crochet hooks that can double as a great photo prop for our social media photos! Besides, the clean, white aesthetic is really motivating for me! I want to note that I definitely believe in a deeper meaning behind Easter and I don’t believe that gifts are the thing to be idolized nor focused on during this holiday, but for someone like myself who genuinely loves to give gifts, I will accept any opportunity I can have to let others know I’m thinking about them. 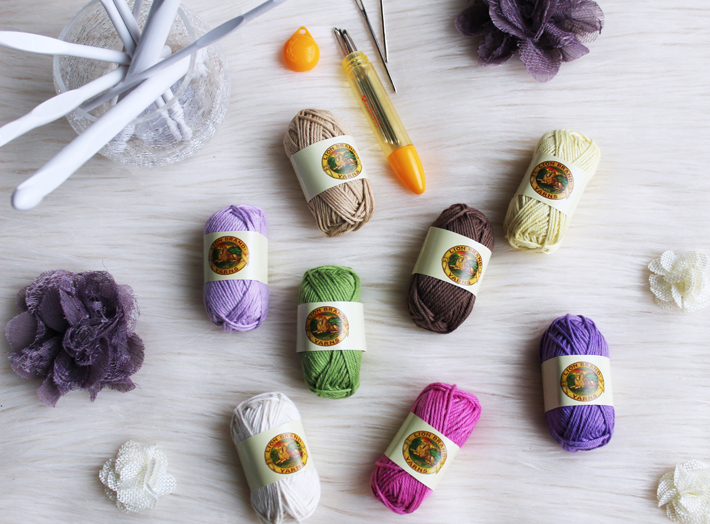 What is missing from my basket choices that you would change or add to your dream gift basket for your crocheter heart? Tell me in the comments below!